Switched on Schoolhouse Curriculum Homeschool Curriculum Review. Switched on Schoolhouse curriculum, an Alpha Omega publication, is a Bible-based program for 3rd-12th grade. It uses a computer based CD-ROM program that includes many helpful resources. This program has five core subjects and many electives to choose from. This curriculum does not use the traditional textbooks and adds games and video clips to enhance learning which adds a little more excitement to school for the student! For the last 4 years my oldest highschool children have used Switched on Schoolhouse for Bible. This year, we added two more subjects, US History and Spanish for my two oldest. Because I teach 8 children, SOS has been a huge blessing to me. Each lesson is graded automatically, it is practically impossible to cheat, and I can see how much time they worked on the lesson. Each day a lesson is given, daily questions are asked, and the grade is added to the report card automatically. Quizzs, papers, and tests are written into the lessons plans...this leaves me a little more free for me to forcus on my younger children. Automatic Grading for student scores and assignments. Games that help children learn new concepts. Some of the games are:Farmer Frank, All Right, Alpha 14, and Spelling Bee. Videos that add to the subject being taught. A Resource Center with a calculator, interactive periodic table of elements, and dictionary. Voice automated lesson texts allow the child to read along as the text is read out loud by the computer. Customizable homepage themes lets students and parents make the theme interesting by picking different colors, putting pictures up, and changing the homepage applications. A daily work report looks at what the child has done that day, making the student more accountable. Printed reports for your files. AOP! 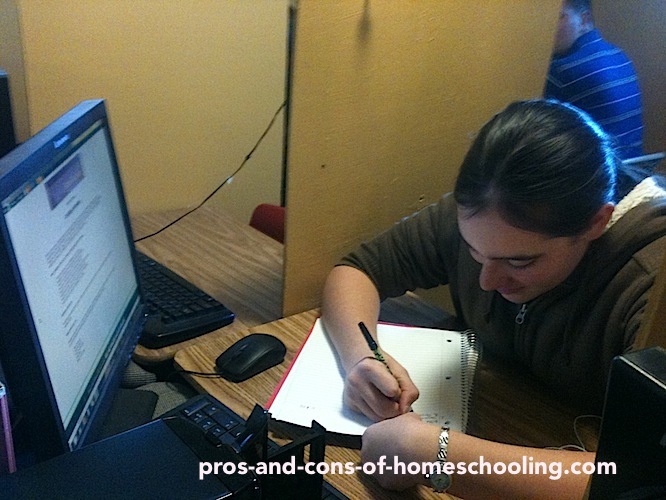 The ultimate homeschool experience! What do you think are the Pros and Cons of this curriculum? Share it! Help others with your review of Switched on Schoolhouse Curriculum. Please include the following information to help your review... just copy and paste in to your review. More Great Switched on Schoolhouse Reviews!